Making Wi-Fi work on your Android phone requires two steps. First, you must activate Wi-Fi by turning on the phone’s wireless radio. The second step is connecting to a specific wireless network. Wi-Fi stands for wireless fidelity. It’s brought to you by the numbers 802.11 and the letters B, N, and G.
Ensure that the Wi-Fi master control icon is on. If not, slide the master control from Off to On to activate the phone’s Wi-Fi radio. If you’ve already configured your phone to connect to an available wireless network, it’s connected automatically. Otherwise, you have to connect to an available network, which is covered in the next section. To turn off Wi-Fi, repeat the steps in this section, but in Step 3 slide the master control icon from On to Off. Turning off Wi-Fi disconnects your phone from any wireless networks. You can quickly peruse your phone’s Wi-Fi settings by choosing the Wi-Fi quick action. See Chapter 3 for more information on quick actions. Some phones may come with a Power Control widget affixed to a Home screen. One of the buttons on that widget is used to turn Wi-Fi on or off. It’s found in the apps drawer, but you’ll also find a shortcut in the quick actions drawer. Don’t touch the Master Control icon, which turns the Wi-Fi radio on or off; touch the Wi-Fi text on the left side of the Settings app screen. You see a list of Wi-Fi networks. In the figure, the Imperial Wambooli network is currently connected. When the phone is connected, you see the Wi-Fi status icon atop the touchscreen, looking similar to the icon shown. This icon indicates that the phone’s Wi-Fi is on — connected and communicating with a Wi-Fi network. Some wireless networks don’t broadcast their names, which adds security but also makes accessing them more difficult. In these cases, touch the Add icon to manually add the network. The command might be titled Add Network. You need to type the network name, or SSID, and specify the type of security. You also need the password, if one is used. You can obtain this information from the girl with the pink hair and pierced lip who sold you coffee or from whoever is in charge of the wireless network at your location. Some public networks are open to anyone, but you have to use the web browser app to get on the web and find a login page that lets you access the network. Simply browse to any page on the Internet, and the login page shows up. The phone automatically remembers any Wi-Fi network it’s connected to as well as its network password. An example is the AS_BOARD_ROOM network, shown. Unlike the mobile network, a Wi-Fi network’s broadcast signal goes only so far. Use Wi-Fi when you plan to remain in one location for a while. If you wander too far away, your phone loses the signal and is disconnected. Many Wi-Fi routers feature WPS, which stands for Wi-Fi Protected Setup. It’s a network authorization system that’s really simple and quite secure. 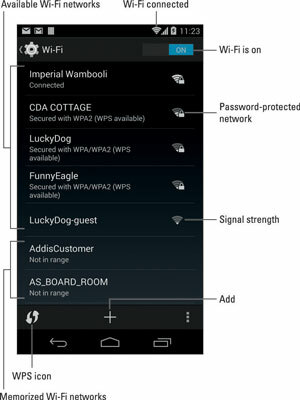 If the wireless router features WPS, you can use it to quickly connect your phone to the network. To make the WPS connection, touch the WPS connection button on the router. The button is labeled WPS or sports the WPS icon. On your phone, visit the Wi-Fi screen in the settings app. Touch the WPS icon to connect to the network. If the WPS router requires a PIN (Personal Identification Number), touch the Action Overflow icon on the Wi-Fi settings screen and choose the WPS Pin Entry item.